The fall of Constantinople to the Turks in 1453 marked the end of the last vestiges of the Byzantine Empire (the Eastern part of the old Roman Empire). The Ottoman Turks, who ruled over the largest empire in the world for over three hundred years, renamed Constantinople “Istanbul”, and turned its great church, Hagia Sophia, into a mosque. 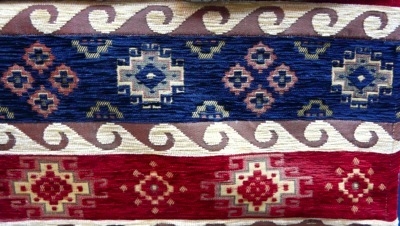 Handwoven rugs are a Turkish art form dating as far back as 7000 BCE. 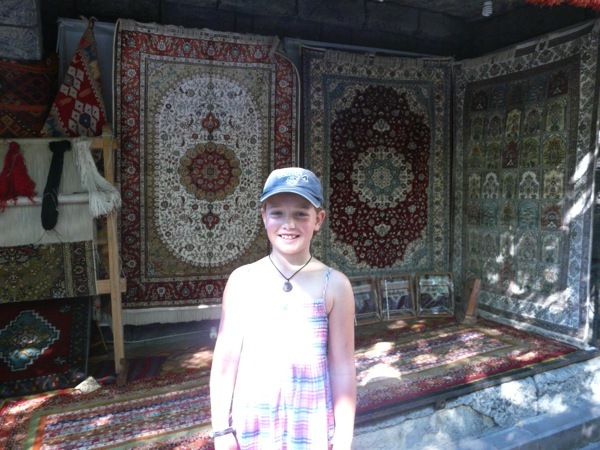 Rugs were used as blankets, and to cover walls, doorways and floors. They have also always been used as prayer mats. Turkish rugs are usually made up of geometric patterns surrounded by a border. 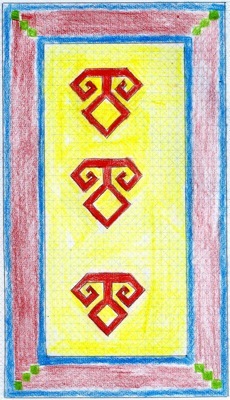 The patterns are symbols, and each colour that is used has a special significance. 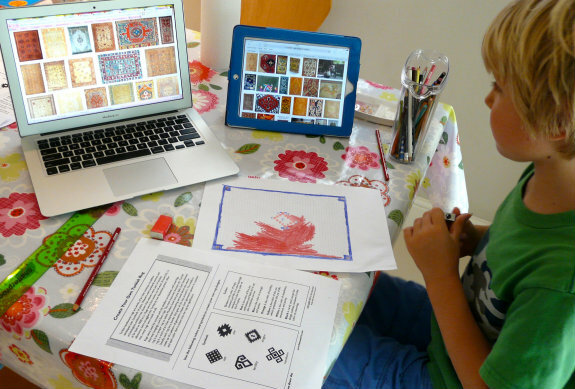 We looked at photos of Turkish rugs and used the information in this Time Warp Trio guide to design our own rugs. I printed us each a piece of isometric graph paper to help us with the geometric aspect. 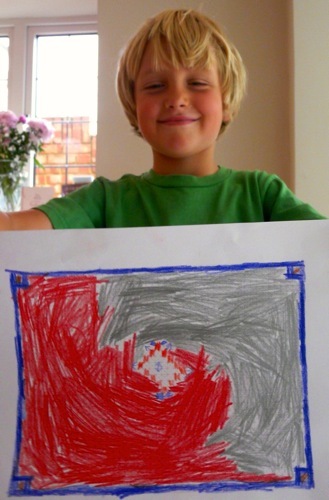 After creating his beautifully geometric centre design and border, J(8) decided to extend the theme with a swirling, dragon-like red and silver colour scheme – resulting in a slightly less authentic Turkish rug, but I can’t fault his creativity! 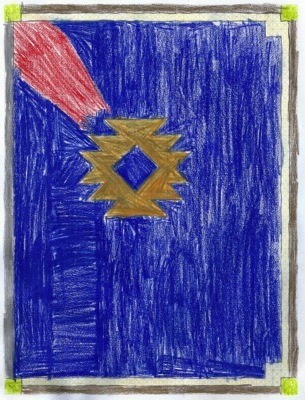 She coloured her rug blue (symbolising strength and power) with smaller amounts of orange (humility) and red (fire, joy, enthusiasm, faith), and dots of yellow (like the sun – symbolising the joy of life) in her rug’s border. My rug is by far the least creative! In the centre are fertility symbols. The blue borders signify strength and power, and the green corners symbolise hope, renewal and life. Green is used only sparingly in Turkish rugs because it is the holy colour of the Prophet, Muhammad. 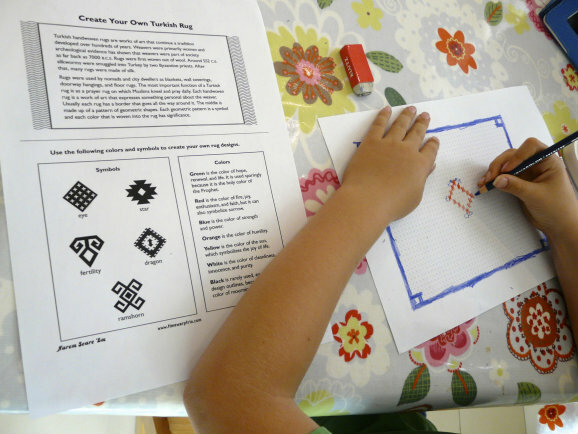 A few days after we designed our rugs we were lucky enough to visit Turkey on holiday. 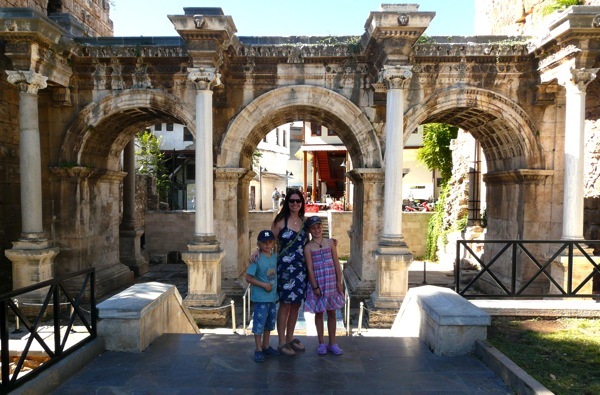 We went to the city of Antalya, which was once a major Byzantine city on the south coast of Turkey. It was fun being able to pick out the symbolism in the rugs we saw. This magnificent gate was constructed in 130 AD in honour of the Roman Emperor, Hadrian. C(9) and J(8) remembered learning about Hadrian’s Wall when we studied Roman Britain, so seeing Hadrian’s Gate – nearly 2,500 miles away – gave them a real appreciation of the size of the Roman Empire! Antalya was conquered by the Turks in the 13th Century. The right hand tower of Hadrian’s Gate was added by a Turkish Sultan around that time. We are visiting Istanbul next year, so we’re looking forward to learning more about this fascinating part of the world and its history! Seriously Lucinda, your holidays make up a whole curriculum package all of their own. I have got to get out more! That is going to be my New Year’s resolution. Must get out more and be like Hwee and Lucinda and visit places. I shall write it in my diary to remind myself. Oh, I don’t have a diary. Must ask for one for Christmas, THEN I’ll write me a note to remind myself! I love all your rugs, BTW! LOL Claire! You do make me smile! 😀 Thank you for brightening my day! What a great idea! 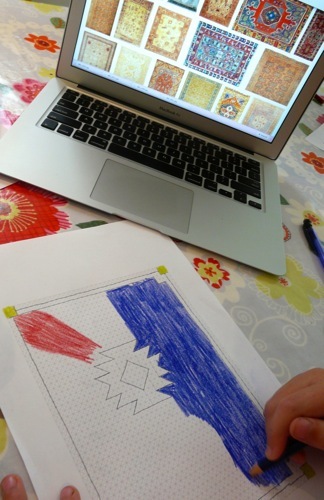 The rugs your kid designed are so creative! I didn’t realize their was so much symbolism in Turkish rugs. Thank you, Marie! It’s wonderful the stuff you find out when you do these projects with your kids, isn’t it? I love this project. We will definately do this one when we get there again in our history studies. It is fantastic that you were able to go to Turkey…what a field trip. Thank you so much Phyllis. Yes Turkey worked out very well! It’s funny, we only went there because there’s an amazing wakeboarding park in Antalya (scene of husband’s broken ankle, oops). 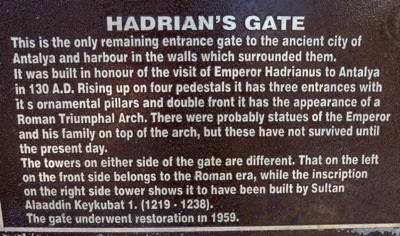 So I was very excited to find out about Hadrian’s Gate! The old town was wonderful too. WOW what a fun week. Visiting other countries is such a treat! Enjoy your weekend. Thanks, Melissa. yes it really is a treat. We are very lucky to have so many “on our doorstep”! 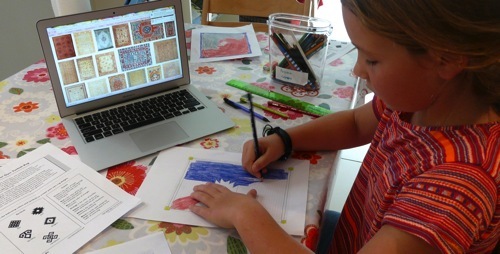 it was a great idea to design your own rugs in conjunction with your trip. I did not realize there was so much significance attached with the colors. Very cool! It was almost coincidental, actually Julie. We booked the trip about a month before we went, and happened to reach the Turkey chapter of Story of the World just before we left. I do like it when things line up like that! I love all the history projects you do with your sweet kiddos but being able to visit places!!! OH MY GOSH!!! How wonderfully blessed you are. I love the picture at Hadrian’s Gate!!! In my perfect world Keilee and I could afford to visit all the places we study. In fact we were talking about it today. I told her I think I would fall on the ground crying if I was in front of the Parthenon!! Happy weekend. We are very blessed, Karen, I agree! I can just see you and Keilee going on the most amazing travel adventures one day. I can’t wait to see the photos! 🙂 Happy weekend to you too! What an AWESOME vacation. I love it. Wow, this is truly an amazing post, Lucinda! Pinning on a few of my boards. God bless and have a lovely night! 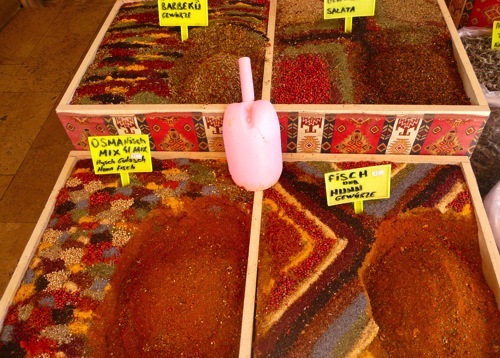 I love the Turkish rug craft, and learning the significance of the colors. Looks like you have a lot of fun schooling. Love your art works! LOL… you do leave the best comments, Claire! Yes I love my Fit Flops!! It’s funny when I dug them out to take to Turkey I thought to myself, “I really must buy some proper, grown-up sandals, one of these days”. But when there are Fit Flops, and Sketchers Tone-Ups… it’s hard to motivate myself to go looking for anything else! Love this idea! I featured your post on Creative Kids Cultural Blog Hop: http://toddlefast.blogspot.com/2013/12/creative-kids-cultural-blog-hop-11.html. I hope you’ll come add another great post. Thank you so much, Kristen! I love the Creative Kids Cultural Blog Hop!